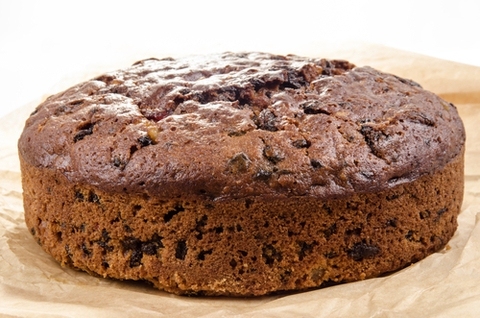 This Christmas cake has just three ingredients! It is super-easy and it's perfect for cooking with the kids or when you are on a budget. Place dried fruit in a bowl and pour over chocolate milk. Cover with cling film and place in the refrigerator overnight. Preheat oven to 180C (160C fan-forced). Line a 20cm round cake tin with baking paper and set aside. Sift self-raising flour over the soaked fruit and stir the mixture until combined. Pour mixture into lined tin and place in the oven for 2 1/2 hours. Check the oven each hour to make sure that the top isn't burning. If you think it will burn then make a cartouche (ring of baking paper) and place on top of the cake. Continue to cook until a skewer inserted into the centre comes out clean.